Lilliana is an outstanding bright, fresh, and boldly multicoloured bouquet of florescent orange and pink Gerberas, sunny, yellow Asiatic Lilies and striking purple Lilies that wont be forgotten in a hurry. Lilies may be sent closed/partially closed in order to prevent damage and to last longerVase not included however; for a serious impression we recommend sending a standard vase to complement Lilliana. Website is easy to use. Receiving an email helped a lot too. Thank you and as always the recipient of the flowers; she absolutely loved them. Absolutely Superb! I ordered from Australia flowers to be delivered to my sick nana. They arrived at the perfect time. Thank you so much. Great range to choose from, fair prices and delivered on time. 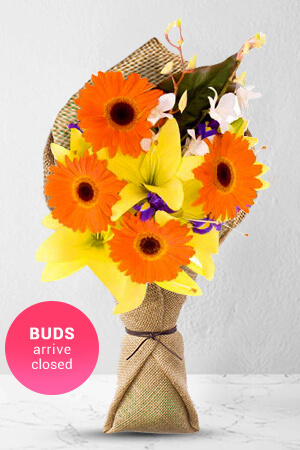 I always use zFlowers.com to send a bouquet to my friend on the anniversary of the loss of her baby. I can rely on zFlowers.com to get the flowers to her on the day and it is really important to me. The flowers were beautiful and arrived promptly. My sister in-law was absolutely thrilled with the bouquet. I will definitely use this excellent service again.